Greg Schulz is currently a Senior Analyst at The Evaluator Group, Inc. Greg has over 25 years experience with UNIX, Windows, IBM mainframe, OpenVMS, and other environments. He started his professional carrier in information technology while in school, working as an operator, loading tapes, key punching (cards and floppy disks), and printing reports. Greg has worked as a programmer (systems and end-user applications), systems administrator, disaster recovery and storage planner, and performance and capacity planning analyst. He has worked at various firms and in several industries, including Cooperative Power Electric Utility, DCA Benefits, BNSF Railroad, MTI, INRANGE, and CNT. Greg works with large and small customers from different industries involving storage and storage networking. He has been involved with various storage-related organizations, including the Computer Measurement Group (CMG), Storage Networking Industry Association (SNIA), RAID Advisory Board (RAB), and vendor-specific user groups. He is the author of numerous published papers and articles on storage, storage networking, I/O, capacity planning, virtualization, security, backup, database, and related topics. 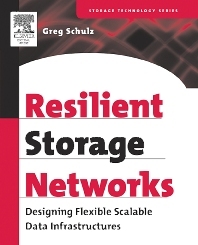 Greg has also contributed material to other projects, and he was a coauthor for the Veritas book The Resilient Enterprise. As a well regarded and popular speaker, he has lectured throughout the world on storage and storage networking topics. Greg has a B.A. in computer science, M.Sc. in software engineering from the University of St. Thomas, and is an aspiring chef. Senior Analyst, The Evaluator Group Inc., Denver Colorado, USA.